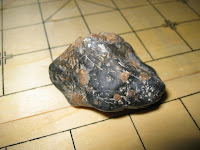 This stone is found deep inside the rocks in river bank near the border of the Pahang Forest Reservation, Malaysia. As it is found outside the reservation area, this stone is clear of enforcement. 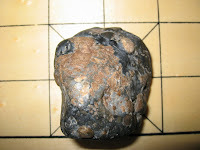 My friends and I dig in about 5 foots deep before we found this stone and dig out hundreds of rocks and sand. 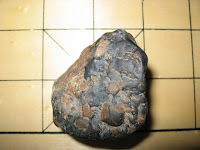 This stone is in Matt black, with copper color partially around it. It is believed the copper color areas is other material that merged into the black stone. Electric Conductivity: Not Conductive, (maybe very low), tested by battery. Thermal Conductivity: Low, tested with gasoline, burn for 10 minutes and remains its shape and color, and not very hot. Oxidation : Believed fully Oxidized, nothing changed since acquired in year 2004. Hardness: Smashed by large hammer, I hurt myself. The stone remains its shape. I really wish to find out what is this stone made of. Sometimes, I even think it is some sort of Meteorite fall in the ancient rain forest in Malaysia thousand years ago, and finally bring down to the river bank by the river after year and year of erosion. Therefore, I decided to sell this stone for anyone that might interested in it, and perhaps has the equipment or knowledge that can identify this stone. If you are it interested in this stone, please visit ebay to buy, thank you.